The 2013 Matt Moscato Golf Charity Golf & Fundraiser was on July 26 at Sylvan Glenn Golf Course in Troy, MI. The 2013’s recipient was the Levi family. Dan, Mellissa, Taylor and Madison. Dan’s doctors found a spinal cord bleed originating in his neck and continuing to his mid back. 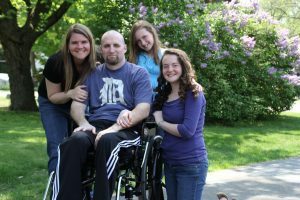 The pressure the clot was applying to his spinal cord has left him paralyzed from his chest down. So on January 9th, 2013 the family was at home having the kids get ready for bed. It was about 9:15pm and Dan was sitting on the edge of our bed playing the latest Hitman game that just came out. He turned off the system because he was having a pain in his right flank (the area just under and behind the armpit). He said “ I must have pulled a muscle or something, can you rub it out for a minute”? Of course Melissa did but as she was it moved to his back. She did not feel very good about it moving so she said “we need to take you to ER”. He still did not think it was serious. Within 7 minutes his right arm started to go numb. She then said “we are going now, get in the car!” He was in so much pain on the way there Melissa must have ran every red light. They pulled up to ER and he could not move his feet or legs. The security guard had to help him get out of the car. They were waiting to check him in and he was wailing. They took him right away. Seven hours later they took him into emergency surgery. They found a bleed in his spinal cord. The bleed or blood clot was the length of his neck to the middle of his back. The doctors said from C2 to T7. The pressure this clot was applying to his spinal cord has left him paralyzed from his chest down. They never expected anything like this to happen. None of the doctors can understand how this happened because there was no trauma. No car accident, no slip & fall, nothing. Some of the blessings that have come out of this is a stronger faith, God can do all things, a complete healing isn’t to hard for Him. Also, their priorities have changed a little, family is more important than work, video games, etc. He was at the hospital for an extended period of time, where they taught him how to live in a wheelchair. He was told he will never walk again. They have two daughters, Taylor age 12 and Madison age 9. They had no idea what the hospital bills are going to total with Dan in the hospital for 8 weeks. They then had on going in-home care with nurses and physical therapy. They had to reconstruct our home to make it accessible for him in a wheelchair. They could not apply for Social Security Disability for at least a year, and this injury has left him unable to work. The golf outing was a huge success with tons of supporters and participants. All proceeds went to Dan and his family to help cover hospital bills, therapy expenses, and fund their home re-model for wheelchair accessibility. Thank you for all those who can to show their love and support for the Levi family.